Well, my Nasty Gal purchases that I talked about in my previous post ( ) just came in recently and you know what that means! A post to go along with them. Unfortunately, I was not as pleased with my purchases from the web site this time as I was the last. I ordered two pieces: one a leopard printed asymmetrical blouse with a cutout back and the second a plaid asymmetrical skirt (not pictured). The skirt I was not happy with. The fabric was very thin and cheap, not something that would be practical for the Fall or Winter. It was also quite see-through, therefore, I will be returning the skirt. The blouse I actually like a lot, but the fabric seems a little cheap for the price I paid of $88. Nevertheless, I’m keeping it. Also a note for ordering clothes from the web site is that all of the items seem to run a size too small. I noticed this last time with the studded collar blouse when I ordered a medium instead of a small because they were out of stock of the small and the medium fit good – it wasn’t too big. The skirt proved this again when I ordered a small (my usual size) and it was a little too tight on me. 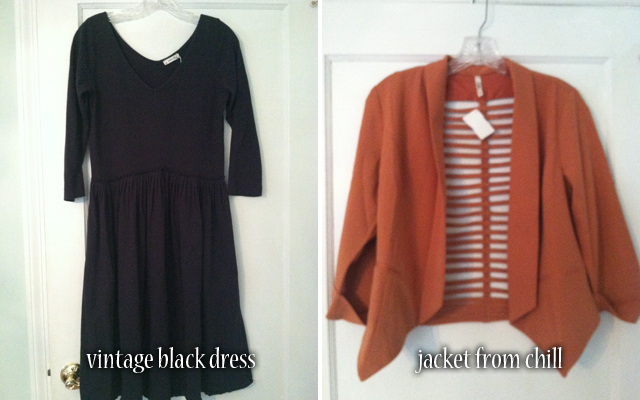 All of my other purchases from the past week I bought in various stores in the city. My friend Dana from Buffalo came to visit me this past week and, therefore, many shopping days in the city were inevitable. First I’ll talk about a shirt I purchased at a store called Town House Shops located on West Broadway between Houston and Bleecker. 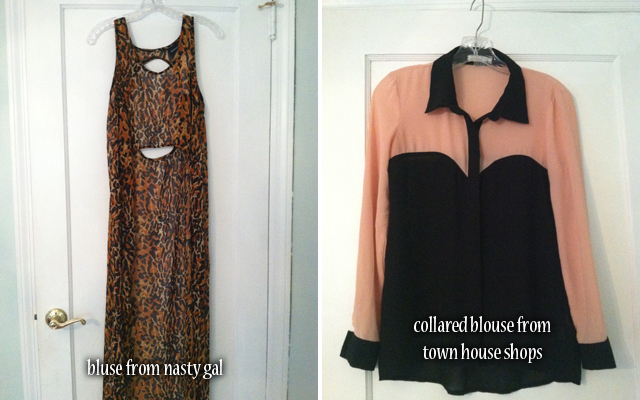 Being collars are one of my current obsessions, I bought a two toned collar blouse of beige and black. I love the shirt and it was only $48. All of the clothing in the store seemed modern, in vintage style, and affordable – all of the main things I look for in a store. Next I bought a jacket from a store called Chill on Broadway in SoHo. The jacket is a wonderful rustic color and has a cool cut out back. I love the jacket and it was a steal for only $30. Chill always seems to have current trendy clothes for really cheap prices. When I was browsing through the store I actually saw a dress from nastygal.com that was going for $80 on the web site for only $30 in Chill. I don’t know how they do it but one thing is apparent – it works. The last two items I’m going to talk about were two of my favorite from the week – one a purely vintage black dress and the other a pair of cut out, laced shoes. The dress I bought at a store called Darling located on Horatio Street in the Meatpacking District. The top level of the store was all vintage inspired clothing, while the lower level was all actual vintage pieces. As I was browsing the top level of the store the saleswoman said to me “everything downstairs is vintage and on sale!” – music to my ears as you could imagine. The dress has a v-shaped neckline, 3/4 sleeves, and is simply wonderful. Frankly, I’m obsessed with it. The dress is extremely flattering and was only $39 with a 50% discount. I do have to get the dress taken in a bit, but I’m still crazy about it and cannot wait to go back to Darling to see what they’ll have for sale next time. 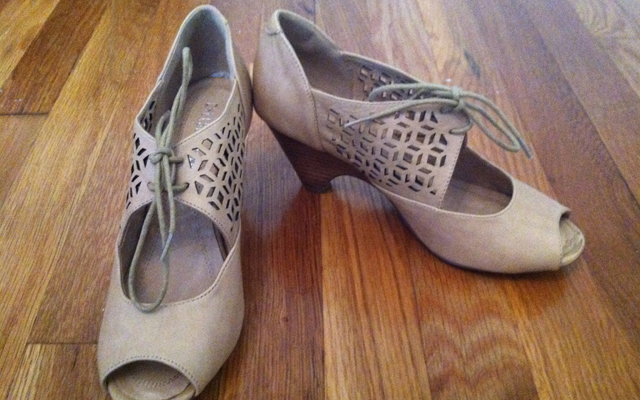 The shoes I purchased at Chelsea Crew in Chelsea Market. I loved them, bought the last pair on the wrack because they were my size, and even bargained a discount on them for being the model shoe (bargaining skills I’ve acquired after years of being an experienced shopper (; ). Other purchases from the week I made at well known stores such as Urban Outfitters and Laila Rowe but are still great. I would possibly try the 30 since you normally wear a 10 in skirts and wear high heels. Have you seen the sizing chart on the website? Here it is: http://www.nastygal.com/customer-care/size-guide. Hope that helps!